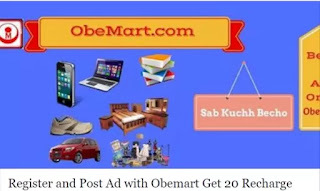 Obemart is a new website which is dedicated for users who want to buy or sell old products. 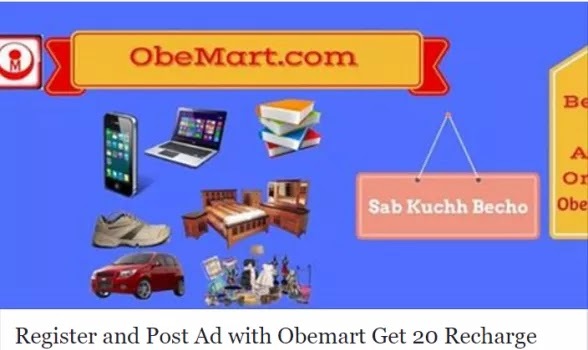 Its more or less like Olx and Quikr where you can publish ad of your product for free and buyers who are interested will reach out to you to buy your product. As A Promotional Offer they are Giving 10 Rs Or 20 Rs Recharge on Publishing a Genuine AD on their Site. How to get Free 10 Rs Or 20 Rs mobile recharge? • Now that’s it ! Congratulations you will be getting your recharge within 10 min. It can be Rs 10 or Rs 20.